The biggest waves at Eshaness Maurice has ever seen! Stuck in a Ditch in Dumfries! Maurice has beeen taking brilliant photos over the winter. 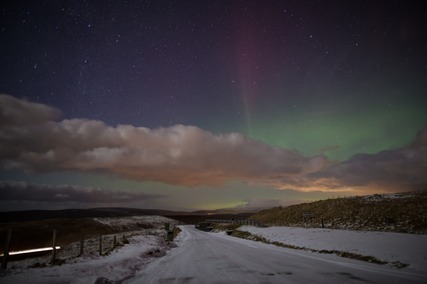 He has shared a time lapse video of Da Mirrie Dancers (Northern Lights) on vimeo for you to see. Stunning work Maurice!! "Here's a still and a link to a peerie time-lapse. �The film amuses me as it was such a tranquil scene but speeded up, there's so much going on! �Clouds moving SE to NW, then you notice that high up the clouds are travelling in the complete opposite direction (strange). �I love seeing the cars go by. You can also see cars away in the distance going over the Scord O' Weisdale. �A group of folk who were looking for the Mirrie Dancers stopped for a photo with me. I kept them in the film :)"